Did you hear about our upcoming retreat? Hear about how it impacted Noa’s life. Fine Artist. Experienced Educator. Single Mom. Noa Zelder enjoys being mom to her four lovely children. She is a fine artist in the vibrant LA community and a successful fine art teacher for the past 20 years. 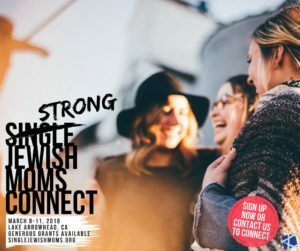 Noa has participated in our Single Jewish Moms Retreat for the past two years, and is very enthusiastic about sharing the inspiration our retreat provides for single moms. Here is a short clip of her talking about her experience with us. with something to say, just like Noa.